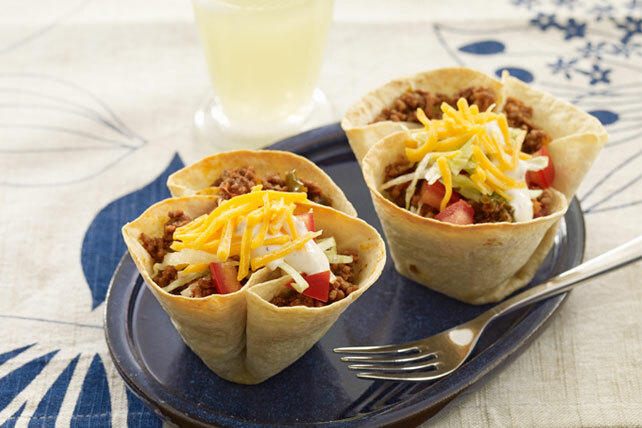 Teach your kids how to make these fun taco cups and start your own little fiesta! 1. PREHEAT oven to 350°F. Microwave tortillas on HIGH 30 sec. or until softened. Press 1 tortilla into each of 8 medium muffin cups to form a bowl. Carefully fold edges back to keep an opening for the filling. Bake 10 min. 2. MEANWHILE, brown meat in large skillet on medium heat (Mom assisted); drain. Stir in salsa; bring to boil. Reduce heat to medium-low; simmer 10 min.,stirring occasionally. 3. CUT lettuce with clean kitchen shears (about 2 cups chopped). 4. CHOP tomato into 1/4-inch pieces with knife (about 1 cup chopped) (Mom assisted). 5. SPOON about 1/4 cup of the meat mixture into each tortilla bowl. Top evenly with cheese, lettuce and tomatoes. Drizzle with dressing. Makes 4 servings, 2 taco bowls each.